Most patients with chronic kidney disease experience abnormalities in serum calcium, phosphorus, parathyroid hormone, and vitamin D metabolism. These can lead to vascular calcification (VC), which has been associated with increased risk for cardiovascular disease and mortality. Although hyperphosphatemia is believed to be a risk factor for mortality and VC, no randomized trial was ever designed to demonstrate that lowering phosphate reduces mortality. Nonetheless, binders have been used extensively, and the preponderance of evidence shows that sevelamer slows the development of VC whereas calcium salts do not. Four studies have demonstrated a slower progression of VC with sevelamer than with calcium-containing binders, although a fifth study showed nonsuperiority. Conversely, the results on mortality with sevelamer have been variable, and data on calcium-based binders are nonexistent. Improved survival with sevelamer was demonstrated in a small randomized clinical trial, whereas a larger randomized trial failed to show a benefit. In addition, preclinical models of renal failure and preliminary clinical data on hemodialysis patients suggest a potential benefit for bone with sevelamer. Meanwhile, several randomized and observational studies suggested no improvement in bone density and fracture rate, and a few noted an increase in total and cardiovascular mortality in the general population given calcium supplements. Although additional studies are needed, there are at least indications that sevelamer may improve vascular and bone health and, perhaps, mortality in hemodialysis patients, whereas data on calcium-based binders are lacking. Most patients with chronic kidney disease (CKD) experience abnormalities in calcium, phosphorus, parathyroid hormone (PTH), and vitamin D metabolism. Hyperphosphatemia that results from declining kidney function is a hallmark of advanced CKD and is associated with abnormal mineral and bone metabolism. In cross-sectional studies, each 1-mg/dl rise in serum phosphorus was associated with a 23% increased risk of death (1). Hyperphosphatemia is also correlated with increased risk of soft tissue and vascular calcification (VC), which may contribute to higher morbidity and mortality (2). Despite the absence of prospective studies to confirm these cross-sectional data, reducing serum phosphorus levels has been at the center of nephrologists' efforts for treatment of dialysis patients for several decades and is now being considered for patients with earlier stage CKD (3). In randomized clinical trials, calcium-based phosphate binders and sevelamer have shown the same phosphorus-reducing ability (4–7). Laboratory experiments, however, have raised some concern regarding the risk of hypercalcemia as an inducer of VC (8,9). Similarly, in clinical studies that demonstrated progression of VC, episodes of hypercalcemia were significantly more frequent among users of calcium-based binders (4,6). In addition to controlling hyperphosphatemia, potentially beneficial effects of sevelamer include its influence on biomarkers such as C-reactive protein (CRP), uric acid, and LDL cholesterol (10–12), as well as bone density (13), structure (14), and remodeling (15,16). This review summarizes studies of calcium salts and sevelamer for treatment of hyperphosphatemia as it may affect CKD and mineral and bone disorders (CKD-MBD). CKD-MBD describes a clinical syndrome that is characterized by a systemic disorder manifested by one or more abnormalities in laboratory parameters, bone histomorphometry, and/or VC or other soft tissue calcification (17). The effects of calcium phosphate binders and sevelamer are discussed in four areas: Biomarkers, VC, bone homeostasis, and mortality. A biomarker is a surrogate indicator of a biologic state. It is a characteristic that is objectively measured and evaluated as an indicator of normal biologic processes, pathogenic processes, or pharmacologic responses to a therapeutic intervention. In theory, if a treatment alters a biomarker that has a direct connection to improved health, then it could serve as a surrogate end point for evaluating clinical benefit. In CKD, multiple surrogate biomarkers have been used to investigate disease progression. These include classical risk factors for cardiovascular disease, such as total cholesterol, LDL cholesterol, and apolipoprotein B (4,10,11), and markers of inflammation such as β2-microglobulin and CRP (10). Since its introduction on the market, significant reductions in total cholesterol and LDL cholesterol have been described with sevelamer, which is likely due to inhibition of cholesterol absorption from the intestine (18). These resin-like activities have not been associated with altered drug absorption (19,20). The acute-phase reactant CRP is often elevated in CKD and has been associated with overall and cardiovascular death in hemodialysis (HD) patients (19,20). Some studies have demonstrated a reduction in serum CRP and in apolipoprotein B after sevelamer treatment, suggesting another potentially beneficial effect of this drug (10,11). These effects were not demonstrated with the administration of calcium salts. A relatively new biomarker is fetuin-A, a negative acute-phase reactant that is involved in bone remodeling in the fetus and demonstrates a powerful inhibitory function of deposition of calcium-phosphate crystals in vitro (21). Decreased serum levels of fetuin-A have been associated with a worse cardiovascular calcification status (22,23). In HD patients, lower fetuin-A serum levels correlated with increased mortality in some (24–26) but not all (27) studies. In a trial of patients with stage 4 CKD and without diabetes, significantly increased concentrations of serum fetuin-A were noted after short-term treatment with sevelamer but not with calcium acetate (28). Because observational studies have demonstrated the association of serum levels of calcium, phosphorus, and PTH with increased mortality in patients with CKD, to a large extent, these, too, could be considered biomarkers (1,21,29). In three randomized trials (4–6) and other studies (6,30), sevelamer was found to be equivalent to calcium-based binders with respect to phosphorus-lowering ability without causing clinical hypocalcemia. In a head-to-head comparison, the PTH-lowering effect of calcium carbonate and sevelamer was found to be equivalent (31); however, it should be noted that serum phosphorus level is a poor indicator of phosphorus retention, because phosphorus levels increase relatively late in CKD. For this reason, attention has recently been focused on fibroblast growth factor 23 (FGF-23). This inhibitor of tubular phosphate reabsorption seems to increase early as kidney function deteriorates. Indeed, FGF-23 levels were found to be inversely correlated with GFR and were predictive of disease progression in a cohort of patients with mild to moderate CKD (32). In HD patients, FGF-23 levels correlate modestly with coronary artery calcium (CAC) score as measured by multislice computed tomography (CT; R = 0.36, P < 0.05) (33). In a cross-sectional study of HD patients, higher serum FGF-23 and phosphorus levels were associated with increased mortality (Table 1) (34). Because of these findings, serum FGF-23 levels have become of interest as a possible marker of response to phosphate binder therapy. A prospective randomized trial evaluated whether 6 wk of sevelamer or calcium acetate treatment decreases serum FGF-23 levels in patients with stage 3 or 4 CKD (33). Absolute and relative changes in FGF-23 levels were threefold greater with sevelamer than with calcium acetate in the presence of equivalent phosphate control (P = 0.0466). Similarly, in a study of 46 HD patients, those treated with both sevelamer and calcium carbonate had a statistically significant decrease in serum FGF-23 levels after 4 wk of therapy, whereas no change was seen with calcium carbonate alone (35). Future trials will clarify whether these effects will result in a favorable outcome with sevelamer phosphate-binding therapy. An important consideration to be made when evaluating biomarkers in CKD is that, in these patients, there are large (nearly 50%) within-subject variations relative to the total variation in measurements (36). It is well established that patients with advanced CKD are at increased risk for VC, which is a significant predictor of morbidity and mortality (37,38). The prevalence of coronary calcification has been estimated at 40% for patients with stage 4 CKD (39), approximately 60% for incident HD patients (40), and approximately 80% for prevalent HD patients (4). Proposed regulators of VC in humans include phosphorus, pyrophosphate, FGF-23/Klotho, bone morphogenetic protein 7, calcium, vitamin D, aldosterone, TNF-α, oxidized LDL, and PTH, among others. Numerous studies have reported an association between increased serum phosphorus levels and greater prevalence of VC and valvular calcification in patients with moderate to severe CKD (41–43). It is therefore conceivable that phosphorus-lowering therapies may reduce VC and decrease mortality. Although no randomized trials have been performed, a recent prospective cohort study that analyzed more than 10,000 incident HD patients found that treatment with phosphate binders was associated with improved survival (as measured by 1-yr all-cause mortality), independent of baseline and follow-up serum phosphorus levels (44). The effect of various phosphate binders on VC and arterial stiffness has been the subject of some debate. Several clinical studies suggested that the risk for VC and/or increased arterial stiffness is greater with calcium-based binders as compared with sevelamer, as discussed herein (2,5,6,22,40–43,45–47). A high cumulative dosage of calcium may also contribute to VC. For example, in children who underwent dialysis, the risk for VC was shown to be associated with the cumulative dosage of ingested calcium (41). The avoidance of excessive calcium intake in the pediatric population, therefore, should be balanced with adequate calcium nutrition. Five studies have evaluated the effects of various binders on VC: Four of HD patients and one in the predialysis setting (Table 2) (4–6,22,48). The Renagel in New Dialysis (RIND) was a prospective, randomized study that compared the effect of sevelamer and calcium-based binders on the progression of VC in 129 adult incident HD patients (6). The CAC score was assessed by CT at baseline and every 6 mo for up to 18 mo. At baseline, a similar proportion of patients in each treatment arm had no detectable CAC (37 and 31%, respectively). Although the CAC score increased significantly in each arm at the end of study, the absolute median increase was 11-fold greater with calcium-based binders than with sevelamer (P = 0.01). As confirmatory evidence of the risk that is inherent with CAC, greater baseline CAC scores were a predictor of all-cause mortality after 4.5 yr of follow-up (P = 0.002) (40). In the Treat-to-Goal (TTG) study, 200 adult patients who were on maintenance HD were randomly assigned to receive a calcium-based binder or sevelamer for 52 wk (4). After the first 12 wk, the dosages of binder, vitamin D, and dialysate calcium concentration were titrated to achieve target levels of serum calcium (<10.5 mg/dl), phosphorus (3.5 to 5.5 mg/dl), and intact PTH (iPTH; 150 to 300 pg/ml). At baseline, CAC was present in 83% of patients and aorta calcification in 80%. The median percentage change in CAC score from baseline was significantly greater with calcium-based binders than with sevelamer at both 26 wk (14 versus 0%; P = 0.002) and 52 wk (25 versus 6%; P = 0.04; Figure 1). Calcium-treated patients had more frequent suppression of iPTH below the target range compared with the sevelamer group (57 versus 30%, respectively; P = 0.001). Change in coronary artery and aortic calcification in TTG study (4). The Calcium Acetate Renagel Evaluation 2 (CARE-2) study was a noninferiority trial designed to compare the effects of calcium acetate and sevelamer on progression of CAC (5). Prevalent HD patients with hyperphosphatemia (N = 203) were randomly assigned to calcium acetate or sevelamer for 12 mo to achieve target phosphorus levels of 3.5 to 5.5 mg/dl. To control for LDL cholesterol lowering by sevelamer (49,50), atorvastatin was administered to the calcium acetate–treated patients to reduce LDL cholesterol levels to <70 mg/dl and to sevelamer-treated patients whose LDL cholesterol failed to reach this level. It is interesting that 97% of the calcium-treated patients and 79% of the sevelamer-treated patients received atorvastatin. After 12 mo, the decrease in mean serum phosphorus level was comparable in both treatment arms. Significant (P < 0.05) between-group differences existed in change from baseline values for adjusted calcium, PTH, and total cholesterol. The mean increase in CAC score was 35% with calcium acetate and 39% with sevelamer (NS). The authors concluded that sevelamer was noninferior to calcium acetate with respect to CAC progression. There were limitations in this study, including the very frequent use of statins in sevelamer-treated patients; a significant difference in end-of-study PTH levels, with the sevelamer-treated patients having a high PTH level compared with studies that demonstrated slowing of CAC with this drug; a large a priori margin (1.8) by which noninferiority was determined; and a high dropout rate (42.7% calcium acetate versus 30.0% sevelamer). Because PTH control seems to be responsible for slowing of VC in animal experiments (51–54) as well as human studies (55,56), it is possible that the lack of inhibition of CAC progression observed with sevelamer was due to insufficient control of PTH. It has also been suggested that patients in CARE-2 may have been at higher risk for VC than those in the TTG study because of differences in baseline characteristics such as higher incidence of diabetic neuropathy, greater prevalence of smokers, and higher iPTH levels (57). It should also be noted that atorvastatin has been described to increase CAC progression in randomized trials of patients without uremia (58–60), and it was used in almost 80% of the patients who were assigned to sevelamer treatment as well as 97% of the calcium-treated patients (59,60). The Phosphate Binder Impact on Bone Remodeling and Coronary Calcification (BRiC) study randomly assigned 101 Brazilian patients who were on maintenance HD to sevelamer or calcium acetate and compared the effects of treatment on CAC and bone histology (48). After 12 mo of therapy, no significant difference was observed in CAC progression or bone remodeling between these two groups. Although all patients were treated with a 1.75 mmol/L dialysate calcium concentration at the start of the study, during the trial patients in the sevelamer group were treated with higher dialysate calcium concentrations than those who received calcium acetate, thereby potentially mitigating any differences between treatment groups. Russo et al. (22) investigated whether differences in CAC score progression could be detected in predialysis patients. In that observational study, 90 patients who had never received a phosphate binder, vitamin D, or statin therapy were treated with a low-phosphorus diet, calcium carbonate, or sevelamer for 2 yr. The annual progression in total CAC score was greatest in the group on the low-phosphorus diet, intermediate in those who were treated with calcium carbonate, and least in the sevelamer arm (Figure 2). These results suggest that phosphate binders could be beneficial in predialysis patients; nonetheless, these preliminary findings require confirmation in randomized studies. Annual progression of coronary artery calcification in predialysis patients. Treatment consisted of low-phosphorus diet only (controls) or in combination with calcium carbonate or sevelamer. Data are means ± SEM. TCS, total calcium score (22). In summary, results from some CKD clinical trials and animal models suggest that the use of calcium-based phosphate binders may accelerate VC. Although the clinical studies have given inconsistent results, differences in study design, study population, dialysate calcium bath concentration, and level of PTH control may account for some of these differences. Furthermore, statistical probability suggests that when several small clinical trials are performed, the null hypothesis will not be rejected in some cases even when true differences exist. The effects of calcium and phosphorus on bone have been widely studied. Calcium is known to play a key role in enhancing peak bone mass in young, healthy individuals, and calcium supplementation may help to prevent osteoporosis in older men and women; however, because most studies of calcium for osteoporosis prevention have also included vitamin D, the contribution of each in reducing fracture risk is unclear. In adult patients with CKD, no data exist demonstrating that exogenous calcium (as supplements or binders) reduces the risk for osteoporotic fracture or increases bone mineral density (accompanying article by Seeman). Current data suggest that non–calcium-containing binders and sevelamer may have differential effects on bone. Indeed, different effects on bone turnover, mineralization, and volume have been attributed to sevelamer hydrochloride and lanthanum carbonate compared with calcium-based binders. How these effects might translate into bone strength or growth remains to be elucidated. In adult patients with stage 5 CKD, low bone turnover (adynamic bone disease) is a common histologic lesion. Children with stage 5 CKD primarily display lesions of high bone turnover (osteitis fibrosa and mixed uremic osteodystrophy), although both high and low bone turnover may occur in either patient population (61). High-turnover bone disease can be associated with deformities, fractures, and growth failure, whereas low-turnover bone disease has been associated with hypercalcemia, VC (in adults), and aggravation of growth failure (in children). Some data suggest that treatment with sevelamer may differentially alter bone histology compared with calcium-based binders and thus could favorably affect these renal-associated bone diseases. Mathew et al. (15) developed an LDL receptor–deficient murine model of VC that is exacerbated by CKD and is associated with adynamic bone disorder. When such animals undergo subtotal kidney ablation and are fed a high-fat/high-cholesterol diet, the vascular disease mimics the CKD-induced VC that complicates the metabolic syndrome, with hypertension, obesity, severe atherosclerotic plaque formation, insulin resistance, early type 2 diabetes, and adynamic bone disease. In this model, treatment with sevelamer decreased serum cholesterol and phosphorus levels. As measured by bone histomorphometry, sevelamer treatment normalized rates of bone formation, mineralization parameters, and trabecular bone volume. In this model of murine metabolic syndrome with CKD, sevelamer reduced VC, possibly in part by reducing hyperphosphatemia and promoting bone formation rate (BFR). These results are supported by other data demonstrating that sevelamer could prevent renal osteodystrophy in a rat model of chronic kidney failure (62). In patients, the relative effects of sevelamer on bone turnover are less clear; however, two clinical trials have evaluated the effects of 1 yr of therapy with sevelamer versus calcium carbonate in adult HD patients, 60% of whom had low-turnover bone disease (14,48). In each study, baseline PTH levels were equivalent, and no differences were observed in bone turnover regardless of phosphate binder therapy. It is interesting that, although final rates of bone turnover did not differ between groups in either study, Ferreira et al. (14) did note that BFR increased from baseline in patients who were treated with sevelamer whereas it remained unchanged in those who received calcium carbonate. These findings raise the possibility that sevelamer may increase BFR during the treatment of adynamic bone disease, an effect that might be more obvious given a larger, more homogeneous sample size. Similarly, lanthanum carbonate has been shown to result in higher bone turnover after at least 1 yr of treatment when compared with calcium-based therapy; this may translate into improvements in bone volume after 2 yr of treatment (63,64). In contrast to patients with underlying adynamic bone disease, current data suggest that sevelamer does not further increase bone turnover in patients with underlying high-turnover renal osteodystrophy. In a trial of pediatric patients with secondary hyperparathyroidism (sHPT) and osteitis fibrosa, both sevelamer and calcium carbonate, when used in conjunction with vitamin D sterols, were similarly effective in controlling serum phosphorus concentrations, reducing serum PTH values, and suppressing BFR (65). Patients who received sevelamer required higher dosages of vitamin D or its active metabolites to maintain PTH levels within target ranges (14,65). Despite the increased dosages of vitamin D sterols, serum calcium levels were maintained in the lower end of the normal range in sevelamer-treated patients in contrast to increasing calcium concentrations in the calcium carbonate group. Thus, during the treatment of sHPT, sevelamer may not cause further increases in BFR. If PTH levels are maintained within appropriate target ranges, however, then bone turnover can be controlled to a similar degree with sevelamer or calcium carbonate. Studies on the effects of lanthanum in pediatric patients or in adults with only sHPT have not been performed. In addition to disorders of bone turnover, alterations in bone mineralization may occur in renal osteodystrophy. In pediatric patients with sHPT, treatment with calcium carbonate resulted in greater improvements in mineralization than did sevelamer (65); however, mineralization did not normalize in any patient, despite ingestion of up to 2.6 g/d elemental calcium in patients who were treated with calcium carbonate. In that study, pediatric patients who were treated with sevelamer ingested a smaller dose of calcium than recommended by the Institute of Medicine Dietary Reference Intakes (66), suggesting that, at least in children, insufficient calcium intake may exacerbate the mineralization defect. This may not be as significant a problem in adults, who seem to have a lower prevalence of defective mineralization (63). Although preclinical data suggest that lanthanum carbonate may exacerbate mineralization defects in rodents (67,68), clinical trials have not confirmed this effect in humans (63,69). Non–calcium-, non–metal-based phosphate binders have been shown to improve bone volume in preclinical models and clinical studies. The beneficial effects of sevelamer on bone volume and strength were seen in a non-CKD model of osteoporosis that involved aged ovariectomized rats (70). Treatment with sevelamer raised the total-body bone mineral density in the femur, tibia, and lumbar spine and also increased the BFR, cortical thickness, and bone volume, resulting in improved bone biomechanical properties. Although many of the clinical trials conducted to date were not designed to demonstrate effects on bone strength and were thus underpowered for this purpose, they do support the benefits suggested by preclinical data. For example, a post hoc analysis was conducted of a randomized clinical trial in which 111 HD patients were treated for 1 yr with a calcium-based phosphate binder or sevelamer (13). Patients who received a calcium-based binder showed a decrease in thoracic vertebral trabecular bone density compared with sevelamer therapy (−7% versus 5%, respectively; P = 0.01) and indicated a trend toward decreased vertebral cortical bone density despite increases in serum calcium levels. Moreover, Fereira et al. (14) demonstrated a decrease in cancellous bone trabecular separation during therapy only in patients who received sevelamer, suggesting that sevelamer may improve trabecular bone structure and density. A few studies addressed the important question of whether a mortality difference is associated with the use of calcium-based binders and sevelamer (6,7,71). Two studies of incident HD patients (one prospective and randomized and one retrospective) showed a survival advantage with sevelamer. In the RIND study described previously, all-cause mortality was a predefined secondary end point (6). After 4 yr, the mortality rate was higher in calcium-treated patients (10.6 per 100 patient-years; 95% confidence interval [CI] 6.3 to 14.9) than sevelamer-treated patients (5.3 per 100 patient-years; 95% CI 2.2 to 8.5; P = 0.05). Multivariate analysis demonstrated improved survival for those in the sevelamer group, after adjustment for confounding variables (hazard ratio [HR] 3.1; 95% CI 1.23 to 7.61; P = 0.02; Figure 3). The strengths of the RIND trial were the enrollment of incident HD patients, long-term follow-up (median 44 mo), and excellent patient retention (127 of the original 129 patients submitted to CT imaging); limitations included the small sample size and randomized binder treatment limited to the initial 18 mo. Using Veterans Health Administration databases, a retrospective cohort study was performed in 1377 incident HD patients who received sevelamer or a calcium-based binder (71). 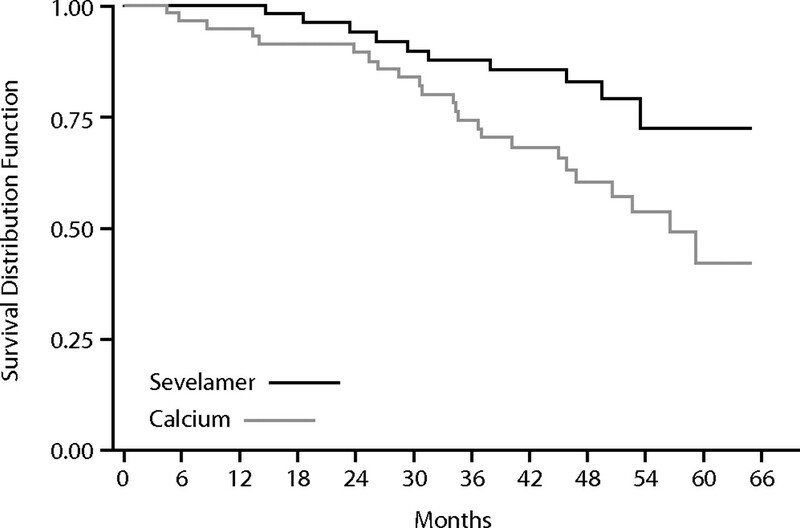 At baseline, patients who received sevelamer were younger than those who were treated with a calcium-based binder (mean age 59.6 versus 63.0 yr, respectively; P < 0.001) and had fewer comorbidities. After correction for differences across treatment groups, the adjusted HR for death was 0.67 (95% CI 0.54 to 0.84), indicating a survival advantage of treatment with sevelamer compared with calcium carbonate. Adjusted survival in RIND study of sevelamer and calcium-based phosphate binders in patients with CKD (6). The effect of sevelamer and calcium-based binders on the survival of prevalent HD patients was evaluated in the multicenter, randomized Dialysis Clinical Outcomes Revisited (DCOR) study (72). In patients who were treated for up to 2 yr, no statistically significant difference was seen in all-cause mortality between the two treatment arms (HR 0.93; 95% CI 0.79 to 1.10; P = 0.40). In prespecified analyses, however, mortality for patients who were aged ≥65 yr (44% of the study population) was lower when treated with sevelamer than with calcium based binders (HR 0.77; 95% CI 0.61 to 0.96; P = 0.02). Despite the large study size, DCOR presented several limitations. Many patients were lost to follow-up or terminated the study early, with approximately half of all enrolled patients discontinuing prematurely (many because of investigators' decision). Practice patterns varied widely and follow-up was short (mean 20 mo). Furthermore, prevalent rather than incident HD patients were enrolled, which may have introduced a survival selection bias. A predefined intention-to-treat analysis of Centers for Medicare and Medicaid Services mortality data was also conducted to assess morbidity and mortality in HD (7). No significant differences were seen in all-cause mortality, cardiovascular mortality, first hospitalization, cause-specific multiple hospitalizations, first morbidity, or multiple morbidity rates. However, multiple all-cause hospitalizations and the number of hospital days were significantly lower in the sevelamer group, which we speculate may accrue substantial cost savings over prolonged treatment periods. In summary, although as suggested in the recent publication of the Kidney Disease: Improving Global Outcomes (KDIGO) guidelines (73) and two meta-analyses (74,75), currently “there is no robust statistically significant difference (between calcium and sevelamer) for mortality,” in the opinion of the authors, the evidence so far accumulated is reassuring and provides an important signal as to the advantage of sevelamer over calcium salts for phosphate binding. Our understanding of bone and mineral disorders in CKD has evolved significantly in recent years, changing the approach to therapy. The link between bone metabolism and cardiovascular disorders has been strengthened and, although incompletely understood, has led to the notion of a common pathophysiologic pathway summarized in the new definition of CKD-MBD. Calcium-based binders and sevelamer are equally effective for treatment of hyperphosphatemia; however, calcium excess accumulated through the use of binders, supplements, and dialysate can lead to hypercalcemia, contribute to VC, and potentially affect bone histology and mortality. Achieving calcium balance and minimizing the concomitant risks of calcium excess is therefore a rational approach for patients with advanced stages of CKD. Indeed, the recent KDIGO guidelines (73) advise restriction and/or avoidance of calcium intake in the presence of proven cardiovascular calcification, persistent hypercalcemia, and hyperparathyroidism as well as adynamic bone disease. Several studies have indicated and KDIGO recently agreed that the use of sevelamer is associated with a lower incidence of hypercalcemia and VC compared with calcium-based binders and does not increase the risk for hypocalcemia. Preclinical and clinical studies suggested that differential effects on bone structure and function may result from the use of sevelamer or calcium salts. Data from some studies suggested a better survival with sevelamer than with calcium-based binders, although additional prospective, randomized studies are needed to confirm these findings. Other pleiotropic effects of sevelamer have not been observed with calcium-based agents, but, to date, these have not been shown to affect outcome. In summary, selection of phosphate binders in CKD-MBD should not be based solely on reduction in serum phosphorus levels but on the overall potential beneficial effects on mineral homeostasis, bone histomorphometry, vasculature biology, and mortality. P.R. has served on an advisory board for and received research grants from Genzyme. S.V. has served on a scientific advisory committee for Pfizer. R.M.M. has received research grants from and consulted for Genzyme and received research grants from Fresenius Medical Care. K.W. has received honoraria from Genzyme. D.M.S. has served on advisory boards for Amgen, Abbott, and Genzyme; has consulted for Amgen; and has received grant support from Amgen, Nephro-Tech, and Genentech.